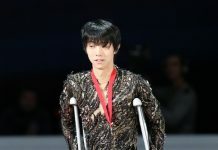 Сегодня состоялся показ вчерашних прокатов японского шоу Fantasy on Ice, в котором принял участие Юзуру Ханю. Таких,как Юдзуру ,наверно больше нет..Выкладывается на 200 %.Программа смотрится подругому ,до слез,Какие мы счастливые, что можем видеть это.Большое ,огромное СПАСИБО. Опять бабочка, пора за стабильность бороться. Интервью, на 90% общие слова. Y: I feel that this has been such a good opportunity as I got to skate like this in front of everyone. Although the choreography of this program is very different, I could put my emotions in it, and I feel the music in the same way I breathe. I think I was able to skate with a lot of expression. I: This must be a special piece for you, how do you feel? Y: Of course it is special, but more than that, I want to level it up with the elements I am challenging right now. In my opinion, adding the 4T3T combination in the second half is an attack for this season, so I put a lot of ambition into it. In these ways, this feels different to when I used this piece before, as it has a big tackle I think. I: By challenging to beat your past self, this will be a new ‘battle’ for you, are you excited about that? 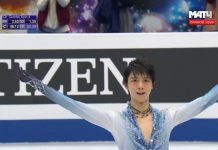 Y: Of course I’m excited, but especially since I’m doing this program, I would like to perfect it. I will work hard to perform well in front of everyone again.